PA soccer player who was imprisoned by Israel agrees to end a hunger strike in exchange for his release. A member of the Palestinian Authority’s national soccer team who was imprisoned by Israel in 2009 on suspicion of terror activities, agreed on Monday to end a hunger strike of more than three months in exchange for his release on July 10. The Associated Press reported that the deal to free Mahmoud Sarsak would end the longest hunger strike ever launched by an Arab prisoner held by Israel. In a symbolic act, the report said, Sarsak ate a small piece of chocolate on Monday evening to show the strike was over. Sarsak, 25, began refusing food in late March. He continued his hunger strike even after the end of the mass hunger strike by thousands of Arab prisoners. He did take vitamins and sugar and drank milk during the strike. As his condition deteriorated, prominent figures in the sports world came to his support, AP reported, noting that FIFA's president asked Israel's football federation to urgently intercede on Sarsak's behalf with the Israeli authorities and FIFPro, an international organization of professional footballers, called for his release. Former Manchester United great Eric Cantona, British filmmaker Ken Loach and others signed a petition calling for freedom for the player, the report added. Last week, the Palestine Football Association (PFA) asked UEFA to bar Israel from hosting the 2013 European Under-21 Championship because of the detention of Sarsak and two other PA Arab players. Sarsak's lawyer, Mohammed Jabareen, said on Monday the agreement to release his client was reached with Israel's Prisons Authority. As part of the arrangement he will be transferred from a prison clinic to a civilian hospital on Tuesday to help him recover from the long fast, the lawyer told AP. On July 10, he is to be released and sent to Gaza, Jabareen added. 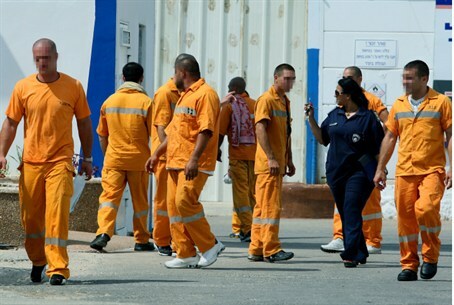 Israel's Prisons Authority spokeswoman Sivan Weizman declined comment Monday. The PA Minister of Prisoners’ Affairs, Isa Karake, announced last week that Arabs serving time in Israel for terror-related offenses are planning a new hunger strike aimed at obtaining the release of Sarsak and two other prisoners.